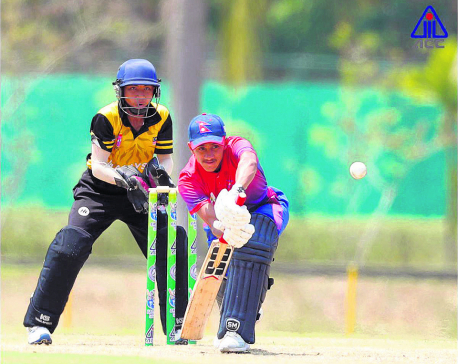 KATHMANDU, April 25: Nepal has posted a target of 235 runs before Thailand in today's final match of group stage under ACC U-16 Eastern Regional Cricket Championship taking place in Thailand. 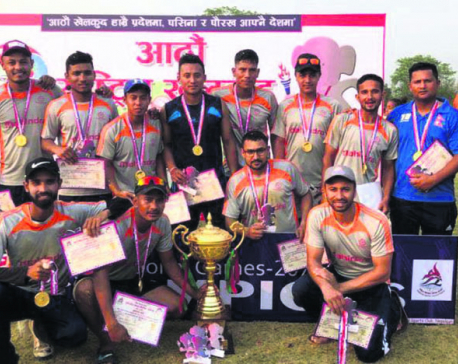 KATHMANDU, April 25: Departmental team Armed Police Force Club (APF) secured its second gold medal in cricket after the men’s team defeated Nepal Police Club by 32 runs in the final match played at Kohalpur Cricket Ground in Banke on Wednesday. APF’s women's team had won the gold medal in cricket on Tuesday. POKHARA, April 25: Gandaki Province is set to host the Ninth National Games after a hiatus of 37 years. It had hosted the second edition of the games back in 1982. 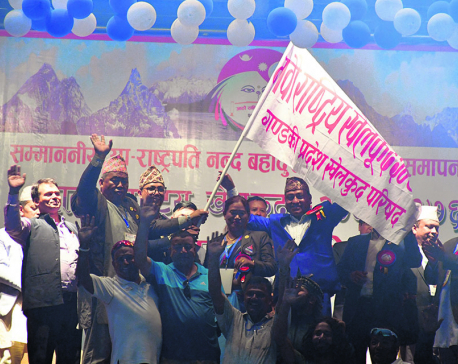 National games will complete its 40 years during the event in Gandaki. 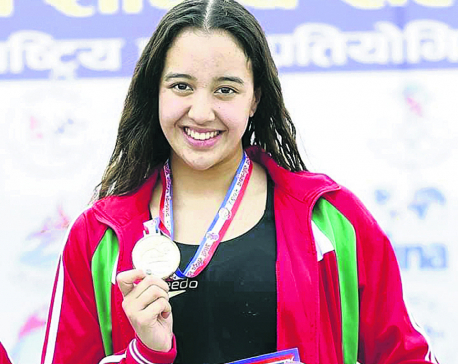 NEPALGUNJ, April 25: On a day when five new national records were either improved or created, Tribhuvan Army Club’s Gaurika Singh on Wednesday managed to improve her three previous national records in swimming at the Eighth National Games in Nepalgunj. 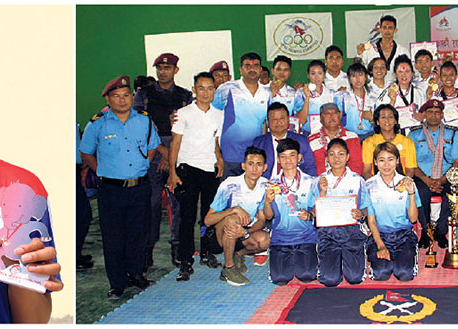 NEPALGUNJ, April 25: Departmental teams Armed Police Force (APF) Club and Nepal Police Club have lifted the men’s and women’s titles respectively in volleyball at the Eighth National Games in Nepalgunj on Wednesday. 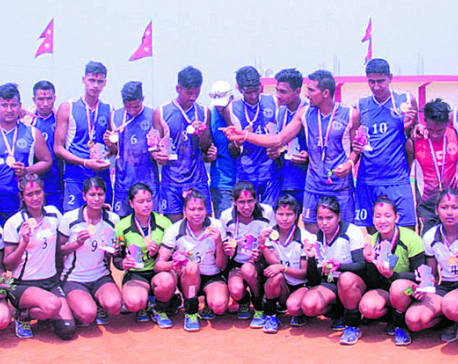 NEPALGUNJ, April 25: A Bikash Tamang decider helped departmental team Tribhuvan Army Club win the gold medal defeating Nepal Police Club 1-0 in men’s football at the Eighth National Games in Nepalgunj on Wednesday. KATHMANDU, April 25: Bowlers helped Nepal U-16 cricket team wrap up the win by 39 runs against Malaysia U-16 during the ongoing ACC U-16 Eastern Region Cricket Tournament in the second group match played at Prem Tinsulanonda International School Cricket Ground in Chiang Mai, Thailand, on Wednesday. Manchester City moved one point ahead of Liverpool at the top of the Premier League after beating Manchester United 2-0 on Wednesday, taking pole position in one of the most thrilling title races in the league’s history. 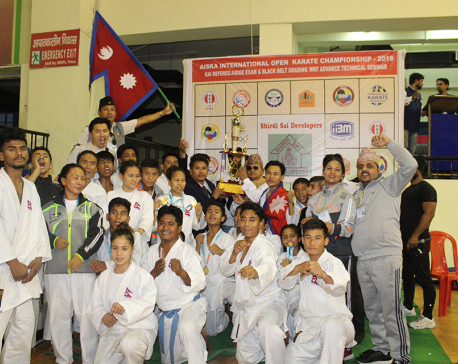 PATNA, April 24: Nepal finished as a winner in the International Open Karate and Kick Boxing championship that concluded here Tuesday. Nepali athletes won 20 gold medals. In the event held at the Pataliputra Sports Complex in Patna, Nepal came first while India and Bangladesh came second and third respectively. NEPALGUNJ, April 24: Province 3’s Sushmita Nepal has set a new national record in women’s 10-meter air rifle in shooting to win the gold medal in the ongoing Eighth National Games on Tuesday.